Great picture but seriously, don't try this at home! 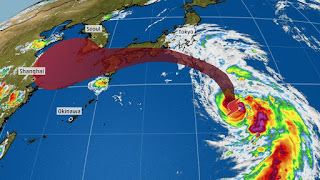 A rare, reverse arc, typhoon, Jongdari (Skylark in Korean (Asia takes turns at naming them if you were wondering)) made landfall overnight on 29 July 2018. 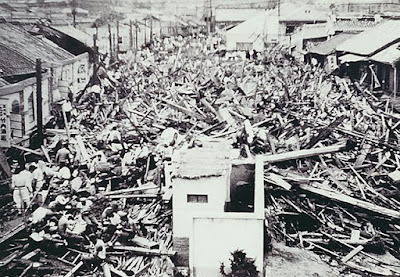 Typically typhoons will arrive from the southwest, often crossing the southern province of Kyushu before skirting along the eastern coast of the main island of Honshu, without always making further landfall, and then slowly dissipating in the cooler waters of the northern Pacific. But not this time. Due to a convergence of higher latitude pressure systems, Skylark came in from the east and I really can't remember the last time that happened. 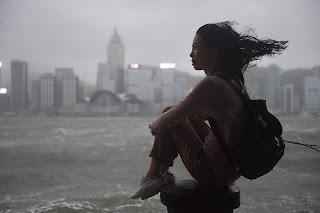 The typhoon crashed on shore a little south of Tokyo, we dodged a bullet and just got very wet, but the storm penetrated far inland and headed southwest through the centre of the country. These are areas usually spared from this type of disaster and the defenses are less than in coastal areas and hence the risks can be higher and damage greater. And then Jongdari passed over western Japan. Those guys didn't deserve this. A month before saw rains at record levels with over two hundred lives lost in the ensuing flood waters. And then there came the record heat, turning the mud flows into concrete. And now there comes a rare inland typhoon. 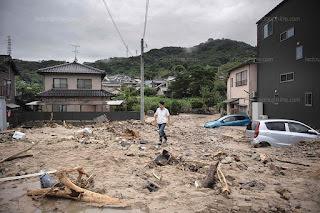 Still, from each disaster, there are learnings, Japan is now so much more prepared for storms that span the planet than in past history. At 9.00am on the morning of 26 September, 1959, Typhoon Isewan (known in the west as Vera) came on-shore south of the Izu Peninsular. And when Vera had left, she'd taken a full 4,000 souls with her. And that didn't happen last night.